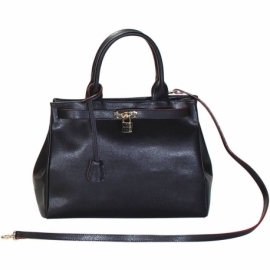 Natural leather handbag, with handle and leather and metal shoulder strap. The shape and the simplicity of its colors create a classical handbag, suitable also for formal situations. It is very comfy, it fits at any age. Color black and pattern plain.